I am not a runner. I don't like running. I do not get those who love it...those who run race after race after race. My husband Ricky ran his 2nd marathon a few weeks ago and of course the boys and I watched and cheered from the sideline. But at mile 26, with just 0.2 miles remaining, he collapsed from heat stroke RIGHT IN FRONT OF US. My head spun as they dunked him in an ice bath, shouted "code 1" and "his temp is rising" and eventually transferred him to the nearest hospital. I was told at one point that the situation was VERY close to being life threatening. On the way home from the hospital, I made him promise me that his marathon running days were behind him. ...Fast forward a few weeks and he told me he just had to do it one more time. He couldn't end on that note, not finishing. Not crossing the finish line. Honestly, I'm surprised it took him so long to say it. I knew it was coming. It took me some time to understand but I finally do. It isn't because he loves running that he wants to get out there and do it all again. It's about more than that. It's setting a goal and following through. It's the ability to feel an extreme sense of accomplishment. And this may sound weird, but at this realization, I suddenly felt a little envious. To know that he was willing to go through the weeks and weeks of training - the early morning and squeeze-them-in-at-lunchtime runs - just to get across some finish line? Perhaps he gets something more from this whole running thing. And I want to push myself to see what that is. So here I am - someone who said they'd NEVER be a runner - deciding to do just that. I know it won't be easy but I also know I'm not the first person - or the first mom for that matter - to take on this challenge. I'm doing this for my kids - so that they see mommy pushing herself and doing something that isn't easy. I'm doing this for my health - I'm not saying I'm in the worst shape ever, but I'm going to have to do a lot more than a detox every few weeks to lose some weight. Most importantly...I'm doing this for me. To feel better. To set a goal and follow through. To feel an extreme sense of accomplishment. - to NOT GIVE UP until I do all of the above! PS - I want to thank my husband for being an inspiration and for going on my first run with me today. By the way, the boys and I will be cheering you on when you cross that finish line at next year's marathon...And maybe one day we will run it together!!! You can do it, Taryn! 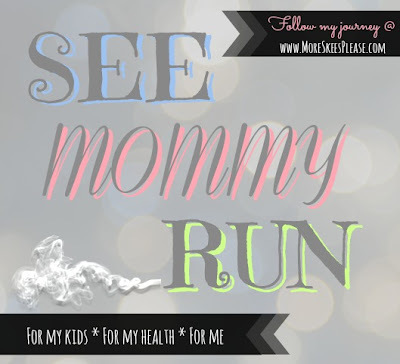 I don't love running either, but with kids, our time is so limited, and running is free and fast. :) I'm 42 and ran the first race of my life last year - the Zooma 5K. A couple of weeks ago, I ran it for the second time and improved by 2 minutes. Now I'm thinking about a 10K too. Good luck! That's so exciting! You can totally do it! I ran my first half 4 months after my second was born after not much training. I'm running my second in 3 weeks much more prepared and ready to beat the clock! Running creates such a feeling of accomplishment for me!